This trip report was written by Orla Bowers, who has been on two Earth’s Edge Expeditions. Her first trek was to the roof of Africa, and her second was to Everest Base Camp. Here she talks about her experience from the food, the games, and the journey to Everest Base Camp from Ireland. To get to Basecamp we first had to get to Kathmandu right in the heart of Nepal. Kathmandu airport demonstrates an impressive calibre of organised chaos and thankfully we had no delays in setting off on the infamous flight to Lukla. Despite fearmongering from friends and colleagues regarding it being “one of the worlds most dangerous landing strips”, it was by far the most spectacular flight I will probably ever take. Leaving Kathmandu we passed endless rice terraces, lush mountains with waterfalls cascading at all angles, and in the distance the snow-capped peaks of the Khumbu region. Taking all this in, we started the descent towards the matchbox-sized landing strip perched against a cliff some 2860m up in the Himalayas. The first few days saw us meandering through beautiful forests of Rhododendron and Juniper. We passed over amazing suspension bridges spanning the Dudh Kosi river and through friendly and quaint Sherpa villages. We spent 2 days in the buzzing town of Namche Bazaar, including one not-very-restful “rest day”. 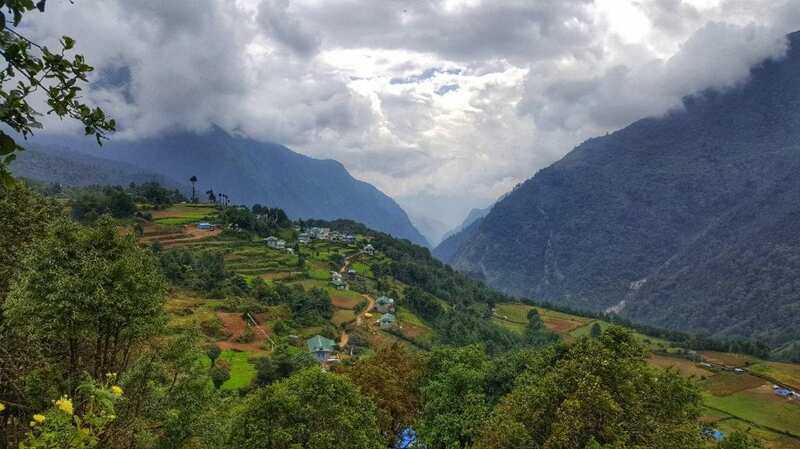 We climbed 400 metres up to the Everest View Hotel which aided our acclimatisation efforts along with providing spectacular views of Thamserku and the horseshoe village. Our expedition leader, Ann, suggested a slight deviation from the traditional route. This allowed us to see more of the region and so from Namche Bazaar we moved above the tree line and went slightly off-piste. The quiet trail led us to the beautiful agricultural village of Phortse and from there onto Dingboche. 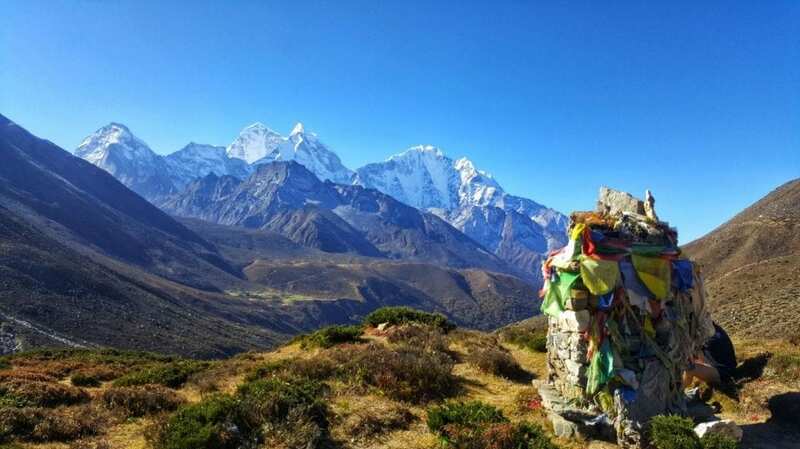 We spent two nights acclimatising in Dingboche and staring in wonderment at the incredible views of Ama Dablam. We all agreed it is one of the most outrageously beautiful mountains we’ve ever seen. Our accommodation was basic but very welcoming and our Sherpa team – Dawa, Pemba, Chhowang, Mingma and Pasang – ensured that our every need was looked after, including a constant supply of lemon and ginger tea! The primary focus of our evenings was layering up, fuelling up and settling in for some highly competitive games of Bananagrams and 25’s. On one particularly wild night up high in the Himalayas, the entire gang (including the Sherpa team) played the Cereal Box game. This was absolutely hilarious and set a few people apart in the flexibility stakes! After acclimatising at Dingboche we moved up higher and following a steep climb from Dughla we passed a very moving memorial to climbers who had lost their lives on Everest. From there we moved to the Pyramid Research Centre at 5040m and were treated to hot showers, a tour of the research facility and the warmest night on the trail. The next day we rose extra early to get moving at sunrise. After a few hours of jaw-dropping trekking along the Khumbu Glacier surrounded by some of the worlds’ highest peaks, we made it to Gorak Shep. Here we dropped any unnecessary gear, grabbed some food and started the final walk into Base Camp. It took around 2 hours for us to reach our goal at the foot of Mt Everest at 5,364m. The sense of collective achievement was palpable as we enjoyed some hot tea, took lots of photos and marvelled at the soaring peaks around us. We even observed a few avalanches in the distance! After a challenging night at Gorak Shep (sleep doesn’t come easy above 5000m! 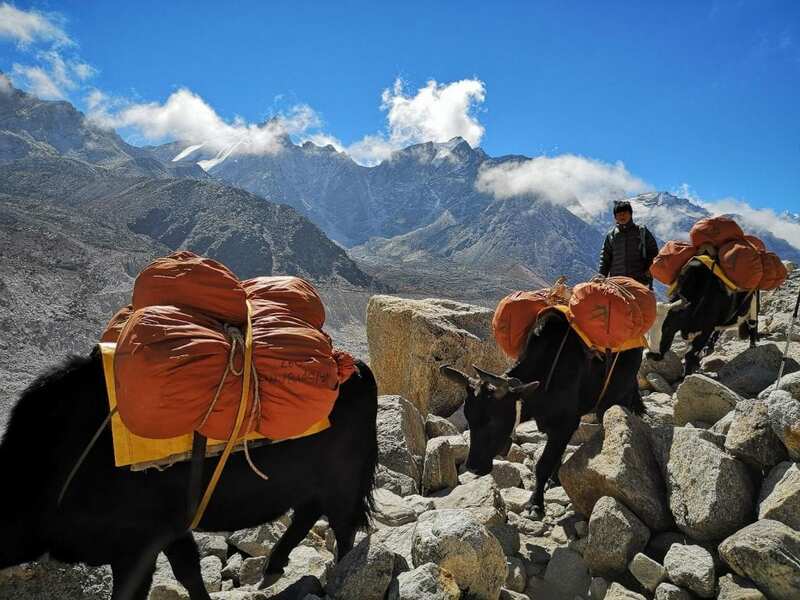 ), we began to make our way back down the Khumbu Glacier. The descent was undulating but stunning as we moved down towards the tree line and into the realms of richer oxygen. It took us 5 days to descend down to Lukla. There, we celebrated our success with the Sherpa team, consisting of lots of dancing and a very memorable sing-song where we observed the amazing musical talents of Claire, Maire and Michael! I went to bed that night with actual pains in my stomach from laughing. 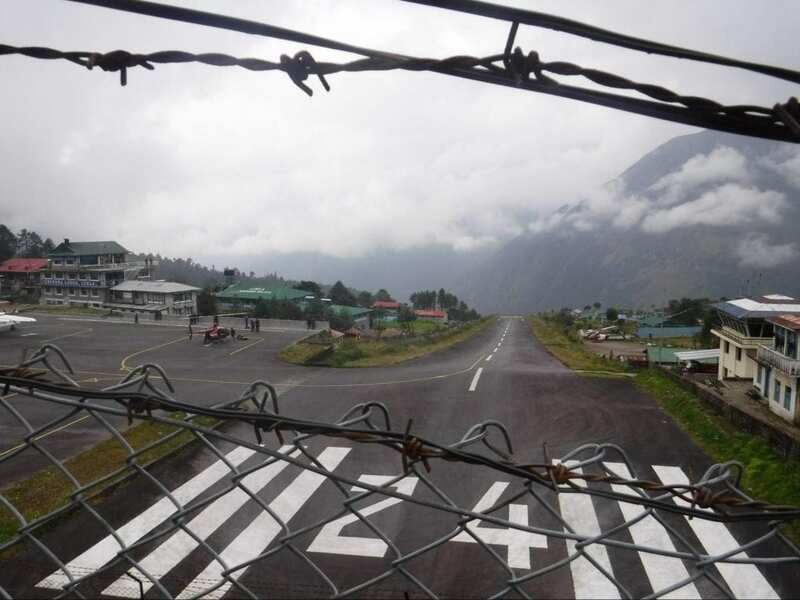 The next morning, with a sore head, we set off to Lukla Airport (20 steps from our tea house!) for the short flight back to Kathmandu. There we sauntered around the local shops, enjoyed another celebratory dinner and even sampled a local nightclub. A few of us agreed that the last two nights celebrating exhausted us more than the 13 days on the trail! 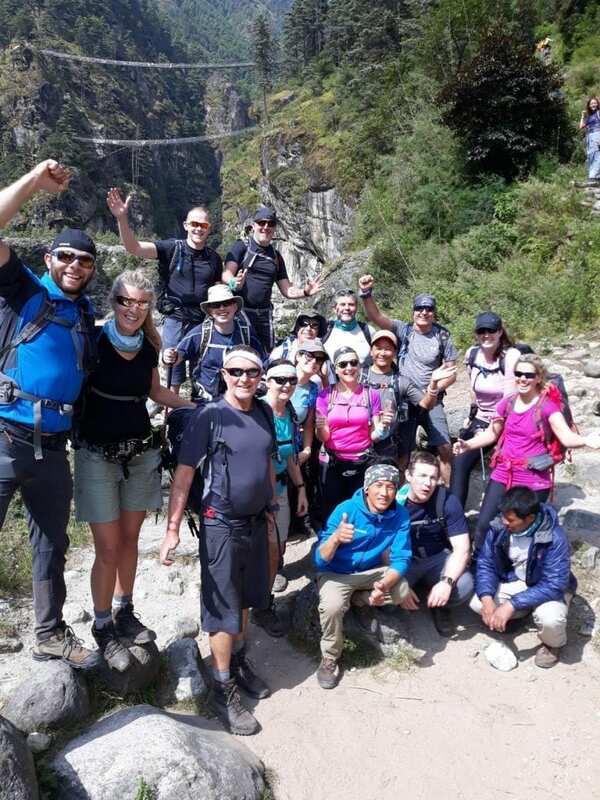 We also all recognised how incredibly lucky we were to have had amazing weather throughout the trip, particularly on the day we made it to Base Camp where there wasn’t a cloud in the sky. 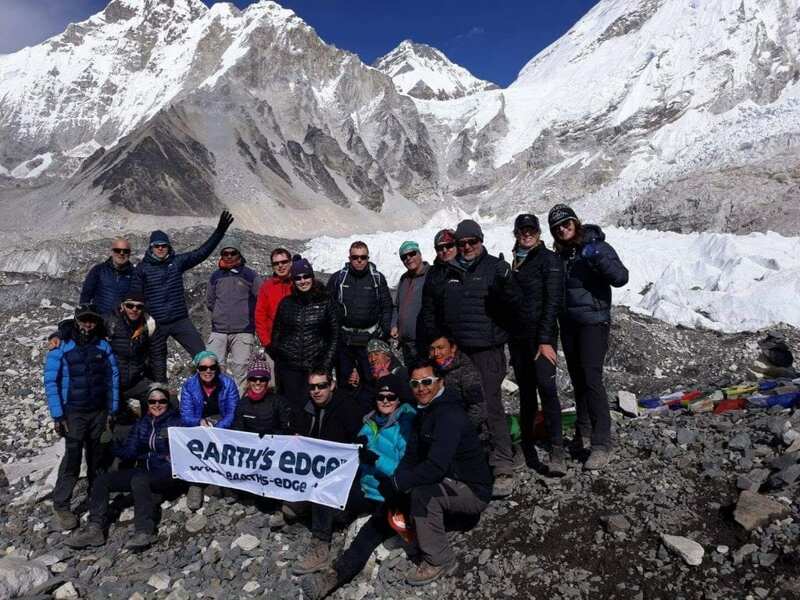 If you’re interested in making your own journey to Everest Base Camp from Ireland, drop us a message in the contact us page, or on the right-hand side of this page! If you want to go ahead and book your Everest Base Camp adventure with us on the Everest Base Camp Trek page.